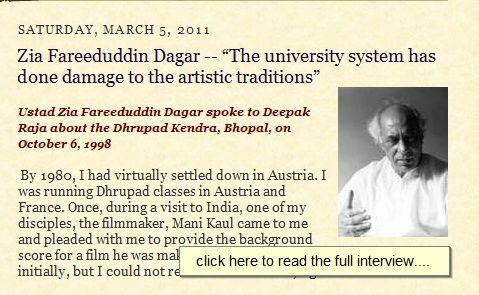 Came across this old interview of Ustad Z. F. Dagar where he talks about his creation - The Dhrupad Kendra, Bhopal. It is truly wonderful how reasoned, trenchant and lively Ustad's observations are in all his public pronouncements. Directorship of the Dhrupad Kendra was an opportunity and a challenge, and it was this man's utter unorthodoxy and willingness to break rules in an intelligent manner that allowed him to overcome adversity and very trying circumstances and do what none of his Gharana members would probably have done.... which is to develop new innovative and unorthodox ways of teaching under new circumstances, to spread the knowledge outside the confines of the Gharana and still keep as true to the tradition as possible. Everything has its pros and cons and today I raise a toast to the genius of Ustad Zia Fariduddin Dagar and what he achieved in his life. Like all geniuses Chote Ustad and indeed all his brothers of the Dagar Gharana are complex, charismatic and truly lovable personalities. Despite their fierce mutual rivalries and the difficult circumstances after Indian independence, the descendants of Zakiruddin and Allabande Khan; – The Dagar Brothers – managed to keep the essence of their knowledge and art alive, often making great personal sacrifices and stoically enduring the disdain and neglect of a society that did not value a contemplative form that did not strive to entertain or please. Meeting them was like coming across a slice of history, of suddenly walking into another age. Hearing myself speak today I realize that I have subconsiciouly imbibed after all these years of sitting in front of them trying to catch every word they utter - their rich Hindi Urdu Sanskrit blend - in the words of Ustad Rahim Fahimuddin Dagar "mili jhuli ganga jamni zabaan". I consider myself truly fortunate to have been able to know and observe my Gurus from fairly close. Looking back at all the ups and downs of my complex relations with them, I can only be filled with great awe, love and respect. How could I have been chosen to come into contact with something so old and so deep. Just my destiny or random chance I guess. After my recent appointment as director of the Dhrupad Kendra Bhopal, the position held by Ustad for many years during which he single handedly reworked the future of the tradition, my job over the next few years would be to strengthen the institution he founded and use it to further the interests of the Dhrupad tradition with fairness, objectivity, impartiality and above all with kindness and humility. 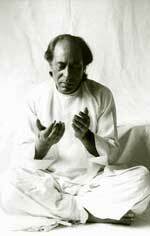 The rate of attrition of knowledge in Dhrupad in recent times has been exponential. Only 20 or 30 years ago a huge repertoire of compositions still remained with some known and many obscure Dhrupad singers, most of whom were struggling to keep singing and at the same time earn a livelihood. I recently tried to locate disciples or recordings of Dhrupad singer Bharatji Vyas (1923-1983) who lived in Baroda, and I came up on a blank wall. 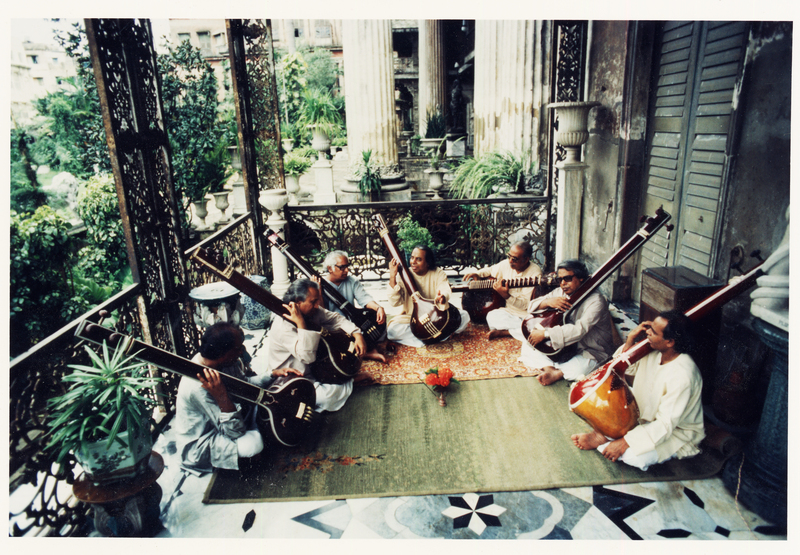 Nothing remains except a few recordings of rare compositions in rare ragas with the Sangeet Natak Academy. Although I am a singer of the style of Dhrupad practised by Ustad and his brothers, I consider it my duty to also work for the preservation of all traditions of Dhrupad and hope that this job will help me in addressing this task as well. Much of the composed repertoire of Dhrupad was common to all the traditions. One hears different versions of the same composition being sung by singers of vastly different traditions. There are many more names I need to look into: T. L. Rana, Gajanana Thakur, Hari Shankar Mishra, Radheshyam Dagur of Tikamgarh.... to see if they left behind a few recordings or taught a few students or notated at least some of the compositions in some handwritten manuscript gathering dust and mould or being devoured by termites somewhere. Some handwritten manuscripts I have located are being zealously guarded by family members of departed musicians who expect to be paid considerable sums of money to part with them. Yet seeing the colossal amounts being mentioned in connection with corruption scandals I cannot blame them. What they expect in comparison for true gems of our heritage is absolute peanuts! Most of that composed repertoire of Dhrupad - little fixed models of Ragas created by master Dhrupad singers of the past to encapsulate the various concepts of classical music and pass them on from generation to generation has now gone to the grave, because the state system failed to reach out to these people and support them and record for posterity the precious bits of knowledge they carried. The recently enlivened debate on corruption and the abuse of power and misuse of public institutions has yet to permeate into the realm of art, culture and heritage management but is sorely needed there. It will also come. Everyone is waiting for someone to stand up and bell the cat. All said and done a lot of knowledge has been lost in the last few decades and yet a lot still remains thanks to the efforts of individual Gurus like Ustad Z. F. Dagar and others who dared to take the initiative and do what they believed should be done in the vastly changed circumstances after independence when the entire class of highly cultivated and musically sophisticated royal patrons literally disappeared overnight. To quote one of my gurus (Ustad Rahim Fahimuddin Dagar) - "yeh sab to bas jhaadan hai. khazane to sab chale gaye. lekin yeh bhi kafi hai." - These are all just leftovers ... the real treasures are all gone.. but still this is enough. In many systems redundancy makes it at least theoretically possible to reconstruct the whole from fragments. Lets hope that the same would be possible for Dhrupad.